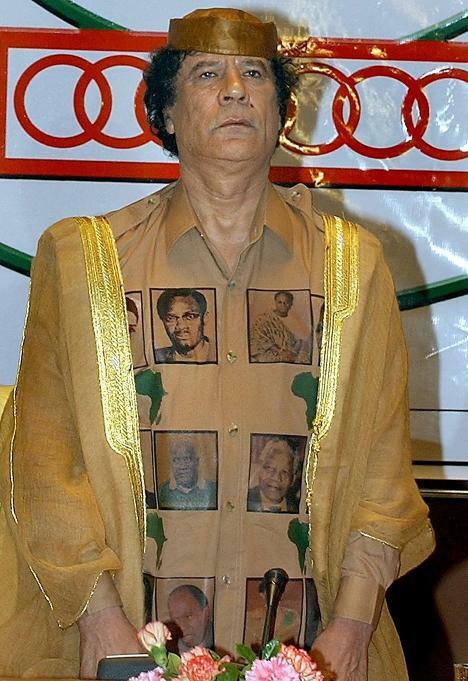 As much as the proposal to put Mummar Gaddafi’s outfits up for display at the Costume Institute of New York should be true in a fully just world, I would imagine that it isn’t. 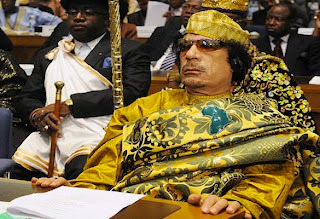 Alas, the West shall be deprived of “four decades of Colonel Gaddafi’s superior dress sense”. And we are weaker for it. However, this did get me thinking. Could Libya make a plausible case that Gaddafi’s outfits (which have been out-Gaga-ing Lady Gaga since well before she was born this way) are in fact ‘cultural property’ under the 1954 Hague Cultural Property Convention? And how could you argue that this isn’t a “work of art”? You know, everything that didn’t happen in Iraq. Of course there is also “immunity from seizure,capture and prize” – so none of the European military advisors on the ground will not suddenly be wearing lots and lots and lots of gold braid. For the sake of humanity, will no one think of the Paco Rabanne sunglasses?